We ended the First Quarter 2009 on a note of cautious optimism, sparked by a strong March rally that lifted the S&P 500 Index to an 8.76%i return for the month. That optimism seemed justified as the rally pushed forward during the Second Quarter 2009, with the S&P 500 Index returning 15.9% for the period and posting a 36% gain since establishing a twelve year low on March 9 ii. Unfortunately, while those robust gains took some of the sting out of the current bear market, the S&P 500 is still well off its September 2008 pre-financial crisis levels – not to mention its October 2007 high. As the rally flattened in June 2009, a number of concerns were raised: Was this a bear market rally, with the slide likely to resume and deepen? Or had the economy and the markets seen genuine signs of recovery? And if we are entering a recovery, how robust will be the market response? Credit is enormously important to the U.S. economy, both for business and consumer spending. The U.S. government has committed trillions of dollars to stabilizing banking and the flow of credit and, while challenges remain, liquidity does seem to be returning to the credit markets. Credit spreads have also declined during the quarter, potentially signaling a greater willingness among investors to shift from the comparative safety of government instruments to corporate fixed income securities. In May, the Federal Reserve released the results of its stress tests of 19 major banks, and announced that 10 needed to raise additional capitaliii – which many did through the sale of non-core assets, issuing new shares, or with the help of the government. The market responded positively to these actions, with the Financials turning in the strongest performance of any S&P 500 sector with a 35.71% return. On the other hand, rising consumer confidence has not been matched by spending, at least for big ticket items. Vehicle sales have never dipped below the 10 million mark for any month since 1982 – until 2009, when each of the first five months of the year failed to reach 10 million vii. (June numbers are not yet available.) Unemployment also continues to rise viii, with higher-than-expected June figures sparking a sharp sell-off just after the quarter end. While the unemployment rates tends to be a lagging indicator that peaks well after economic growth has been re-established, it may inhibit consumer spending, which in turn may slow recovery. The end of a recession, like the beginning, is only identified in retrospect. Estimates for when the current recession will end have ranged from the Fed Chairman Ben Bernanke’s May 5 testimony ix that the recession might be ending during the Second Quarter 2009, to more cautious estimates that the recession will linger until early 2010. One optimistic assessment comes from Ned Davis Research, Inc.,x which has tracked a group of 12 indicators, including the S&P 500 Index, nonfarm payrolls, sentiment indicators, credit spreads and others, which they believe have been the most reliable at indicating the end of a recession. As of early June, they reported that all 12 indicators were signaling that the recession had finally bottomed and was moving toward expansion. It goes without saying, of course, that historical comparisons, while suggestive, are not guarantees. Perhaps the biggest debate among investment managers over the quarter has been regarding the nature of the recent rally. Is this the beginning of a new bull cycle, or is it a bear market rally with new lows to come? Some bearish commentators look to 1930, when the market (as measured by the Dow Jones Industrial Average) recouped more than a third of the original 1929 stock market crash, only to sink drastically lower, reaching a bottom in 1932 that erased over 80% of the previous market highs. Most commentators, according to our review, lean towards the more positive outlook that we will experience a correction before the up cycle resumes. Ned Davis Researchxi, to name one example, conducted a historical analysis of similar bull markets, and their conclusion is that today’s cycle most resembles 1974, which saw a shallow – 5.6% correction before the recovery resumed. Ultimately, what will determine the direction of the market over the remainder of 2009 is the degree of concrete evidence that the economy is indeed recovering. The argument can be made that the market has priced in a third quarter recovery, as well as assumptions about the strength of the recovery. In order for current stock valuations to be sustained, let alone advance, recovery signals will have to become more pronounced. Disappointing economic news may not lead to severely declining prices, but it may leave the market stagnant for months to come. The market rally that began in mid-March was global in scope and brought welcome relief to investors faced with the steepest bear market in decades. The next months are critical as the market seeks to consolidate gains and the economy finds its bearings. In any market environment, a diversity of asset classes, portfolio strategists and approaches to asset allocation can balance risks and rewards, helping you capture returns with reduced volatility. We look forward to discussing your evolving financial goals, as well as reviewing the mixture of asset allocation approaches within your portfolio, as we seek to keep your investment plan aligned with your needs. As always, we thank you for the trust you have placed in us. i All Index returns verified on www2.standardandpoors.com unless otherwise indicated. At the end of the second quarter of 2009 the Dow Jones Industrial Average returned 11.96% for the quarter and -2.01% for the yeari. The S&P 500 index finished up 15.93% for the quarter and 3.16% for the year ii. Within U.S. equity markets, small/mid-cap stocks fared better than large-cap stocks for the quarter. Value outperformed growth among large-cap stocks; however the opposite was true for small/mid-cap stocks. In the international arena, the MSCI EAFE Index (a proxy for developed international markets) posted a return of 25.85%iii for the quarter and 8.42% for the year. The MSCI EAFE Emerging Markets Index posted an increase of 34.84% during the quarter and a 36.22% for the year. The FTSE NAREIT Index returned 28.85% during the quarter and -12.21% for the year. 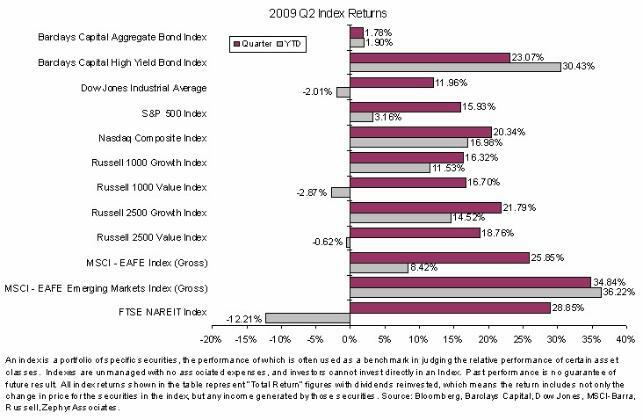 In the bond markets the Barclays Capital Aggregate Bond Index returned 1.78% during the quarter and 1.90% for the year. The U.S. Economy contracted 5.5% during the first quarter improving relative to a 6.3% contraction experienced during the fourth quarter of 2008. The Federal Reserve (“the Fed”) decided to keep the Fed Funds target rate within the 0.00% – 0.25% range in June. Measured by the Consumer Price Index, inflation for the month of May was -1.3% on a year-over-year basisiv . Unemployment, as measured by the jobless rate released by the Bureau of Labor Statistics in June was 9.5%. Oil futures closed at $69.89 per barrel in June, a price increase of 40.74% from its close from the first quarter of 2009v . The U.S. Dollar depreciated against the Euro by 5.67% for the quarter; and depreciated 2.46% versus the Japanese Yen for the same period vi.